Common-rail direct fuel injection is a direct fuel injection system for diesel engines. On diesel engines, it features a high-pressure (over 100 bar or 10 MPa or 1,500 psi) fuel rail feeding solenoid valves, as opposed to a low-pressure fuel pump feeding unit injectors (or pump nozzles). Third-generation common-rail diesels now feature piezoelectric injectors for increased precision, with fuel pressures up to 2,500 bar (250 MPa; 36,000 psi). In petrol engines, it is used in gasoline direct injection engine technology. The common-rail system prototype was developed in the late 1960s by Robert Huber of Switzerland, and the technology was further developed by Dr. Marco Ganser at the Swiss Federal Institute of Technology in Zurich, later of Ganser-Hydromag AG (est.1995) in Oberägeri. The first successful use in a production vehicle began in Japan by the mid-1990s. Dr. Shohei Itoh and Masahiko Miyaki of the Denso Corporation, a Japanese automotive-parts manufacturer, developed the common-rail fuel system for heavy-duty vehicles and turned it into practical use on their ECD-U2 common-rail system mounted on the Hino Ranger truck and sold for general use in 1995. Denso claims the first commercial high-pressure common-rail system in 1995. Modern common-rail systems, although working on the same principle, are governed by an engine control unit, which opens each injector electrically rather than mechanically. This was extensively prototyped in the 1990s with collaboration between Magneti Marelli, Centro Ricerche Fiat, and Elasis. After research and development by the Fiat Group, the design was acquired by the German company Robert Bosch GmbH for completion of development and refinement for mass production. In hindsight, the sale appeared to be a strategic error for Fiat, as the new technology proved to be highly profitable. The company had little choice but to sell Bosch a licence, as it was in a poor financial state at the time and lacked the resources to complete development on its own. In 1997, they extended its use for passenger cars. The first passenger car to use the common-rail system was the 1997 model Alfa Romeo 156 2.4-L JTD, and later that same year, Mercedes-Benz introduced it in their W202 model. Common-rail engines have been used in marine and locomotive applications for some time. The Cooper-Bessemer GN-8 (circa 1942) is an example of a hydraulically operated common-rail diesel engine, also known as a modified common rail. Vickers pioneered the use of common-rail injection in submarine engines. Vickers engines with the common-rail fuel system were first used in 1916 in the G-class submarines. It used four plunger pumps to deliver a pressure up to 3,000 pounds per square inch (210 bar; 21 MPa) every 90° of rotation to keep the fuel pressure adequately constant in the rail. Fuel delivery to individual cylinders could be shut off by valves in the injector lines. 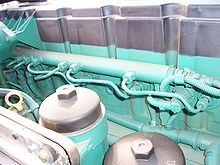 Doxford Engines used a common-rail system in their opposed-piston marine engines from 1921 to 1980, where a multicylinder reciprocating fuel pump generated a pressure around 600 bars (60 MPa; 8,700 psi), with the fuel being stored in accumulator bottles. Pressure control was achieved by an adjustable pump discharge stroke and a "spill valve". Camshaft-operated mechanical timing valves were used to supply the spring-loaded Brice/CAV/Lucas injectors, which injected through the side of the cylinder into the chamber formed between the pistons. Early engines had a pair of timing cams, one for ahead running and one for astern. Later engines had two injectors per cylinder, and the final series of constant-pressure turbocharged engines was fitted with four injectors per cylinder. This system was used for the injection of both diesel and heavy fuel oil (600cSt heated to a temperature near 130°C). The common-rail system is suitable for all types of road cars with diesel engines, ranging from city cars (such as the Fiat Panda) to executive cars (such as the Audi A8). The main suppliers of modern common-rail systems are Robert Bosch GmbH, Delphi, Denso, and Siemens VDO (now owned by Continental AG). Solenoid or piezoelectric valves make possible fine electronic control over the fuel-injection time and quantity, and the higher pressure that the common rail technology makes available provides better fuel atomisation. 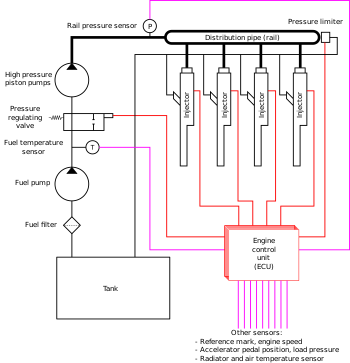 To lower engine noise, the engine's electronic control unit can inject a small amount of diesel just before the main injection event ("pilot" injection), thus reducing its explosiveness and vibration, as well as optimising injection timing and quantity for variations in fuel quality, cold starting, and so on. Some advanced common-rail fuel systems perform as many as five injections per stroke. Common-rail engines require a very short to no heating-up time, depending on the ambient temperature, and produce lower engine noise and emissions than older systems. They are cam driven, and injection pressure is proportional to engine speed. This typically means that the highest injection pressure can only be achieved at the highest engine speed and the maximum achievable injection pressure decreases as engine speed decreases. This relationship is true with all pumps, even those used on common-rail systems. With unit or distributor systems, the injection pressure is tied to the instantaneous pressure of a single pumping event with no accumulator, thus the relationship is more prominent and troublesome. For the typical distributor/inline system, the start of injection occurs at a predetermined pressure (often referred to as pop pressure) and ends at a predetermined pressure. This characteristic results from "dumb" injectors in the cylinder head which open and close at pressures determined by the spring preload applied to the plunger in the injector. Once the pressure in the injector reaches a predetermined level, the plunger lifts and injection starts. In common-rail systems, a high-pressure pump stores a reservoir of fuel at high pressure — up to and above 2,000 bars (200 MPa; 29,000 psi). The term "common rail" refers to the fact that all of the fuel injectors are supplied by a common fuel rail which is nothing more than a pressure accumulator where the fuel is stored at high pressure. This accumulator supplies multiple fuel injectors with high-pressure fuel. This simplifies the purpose of the high-pressure pump in that it only needs to maintain a target pressure (either mechanically or electronically controlled). The fuel injectors are typically ECU-controlled. When the fuel injectors are electrically activated, a hydraulic valve (consisting of a nozzle and plunger) is mechanically or hydraulically opened and fuel is sprayed into the cylinders at the desired pressure. Since the fuel pressure energy is stored remotely and the injectors are electrically actuated, the injection pressure at the start and end of injection is very near the pressure in the accumulator (rail), thus producing a square injection rate. If the accumulator, pump, and plumbing are sized properly, the injection pressure and rate will be the same for each of the multiple injection events. ^ "DENSO Develops a New Diesel Common Rail System With the World's Highest Injection Pressure | News | DENSO Global Website". DENSO Global Website. Archived from the original on 2017-10-13. Retrieved 2017-12-14. ^ "240 Landmarks of Japanese Automotive Technology - Common rail ECD-U2". Jsae.or.jp. Archived from the original on 2009-09-08. Retrieved 2009-04-29. ^ "Diesel Fuel Injection". DENSO Global. Archived from the original on 2011-08-07. Retrieved 2011-08-03. ^ "Fiat Rebirth of a carmaker". economist.com. 2008-04-24. Archived from the original on 2009-09-08. Retrieved 2008-05-01. ^ "New Powertrain Technologies Conference". autonews.com. Archived from the original on 2012-01-07. Retrieved 2008-04-08. ^ Cummins, C. Lyle (2007). Diesels for the First Stealth Weapon. Carnot Press. pp. 196–198. ISBN 978-0-917308-06-2. ^ "Doxford Engine Reference". Archived from the original on 2007-12-20. ^ "Denso targets French, US automakers : World's No. 4 supplier will grow organically, not by acquisitions". Europe.autonews.com. Retrieved 16 May 2018. 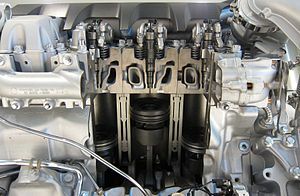 Wikimedia Commons has media related to Common rail fuel injection.